It doesn’t drive me crazy, more than likely because I learned how to drive here, but I can understand why Austin Roads and Highways have the potential to not drive you to your destination, but drive you to the nut house. So, as a guide, I have drawn a map of Austin for reference. So, first of all, Loop 1 and Loop 360 aren’t really loops. 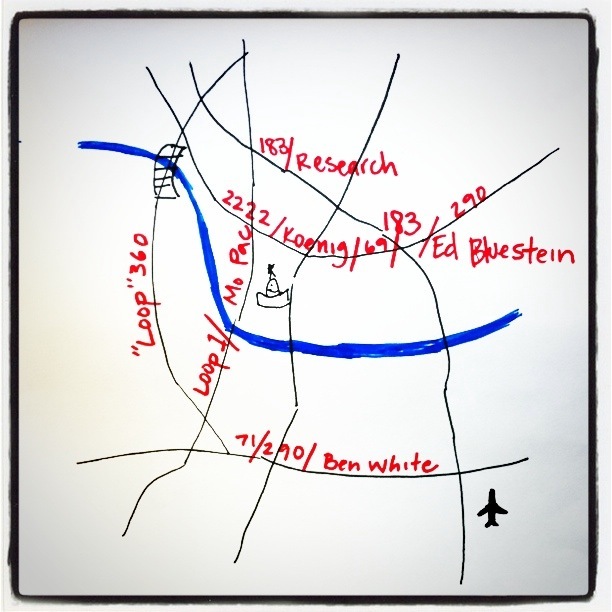 Loop 1 is better known as MoPac (the rail line) and we have at least 3 names for almost each highway: 183/Research Blvd (UNDERNEATH 183)/Ed Bluestein Blvd, 290/71/Ben White, 2222/Koenig/290… and yes. 290 runs parallel in two separate parts of town. Any questions? I’m sure there are. So, just do what I do, point your car toward the general area of your destination and drive. Our next lesson will be how to pronounce Guadalupe and Manchaca correctly.